I'm looking for an open source cloud GIS solution. Current situation: Up to 100gb of data stored in file geodatabases that is updated daily. Data is used to create maps as well as geoprocessing tasks. Ideally I only want one copy of the data however it needs to be shared across multiple companies working on the project who will also be adding new data and updating old. The GIS users are using ArcGIS Desktop v10.1 but for the rest of the project team I would like to have a data viewer that can do simple tasks such as measure and buffer. If we could create a few custom tools for the data viewer that would be great. Manageable from custom front end? I am hoping to achieve a solution that is cost effective and well supported. I'm thinking it will be a bolt together solution made up of multiple components but I just don't know where to start. There are better options than file geodatabases for storing the data which are better suited to multiple access but I can't remember what they are called (still an ESRI database)? Happy to use large database functionality attached onto them such as SQL or Oracle - would this help? I don't have ArcGIS Server only desktop which we'd like to remain using.... Surely open-source elements can still use ESRI desktop? I haven't had much joy with decent viewers either - the only two nice ones I have seen are Autodesks Infrastructure Modeller (Autodesk 360) and Google Earth Builder.... I know there is a price to pay for those two but if there is nothing open source that matches then I would be willing to pay. Apparently ArcGIS Online doesn't allow you to even interrogate raster images which would be no use to us as we deal with height data a lot. Hence this is probably going to be a miss match of all sorts of software but I'm sure I can get something working? I would also like a customised metadata editor rather than the nasty one in ArcCatalog... Something that would log the incoming data in a database and also apply that same metadata to the feature classes in the geodatabases automatically. I don't like producing lose XMLs like you get with shapefiles. Am I just setting unrealistic targets with pie in the sky dreaming or do you think something is achievable? File geodatabases are the enemy of open source - if you change this to PostGIS or shapefiles, or similar, you'll have more luck. Otherwise you're looking for a ton of features. You'll have some luck with GeoServer, but otherwise you might want to reconsider the scope of what you're looking for. My suggestion would be to use the osgeo stack. Specifically, I have used this stack in the Amazon Cloud (AWS) to serve out large raster and vector data sets. Postgresql with postgis stores my vector data Geoserver / Geowebcache servers the vector data and tiles those large datasets for serving. Everything runs through the browser using OpenLayers. I bailed on GeoExt and have been rolling solutions using Geodjango / jQuery with a bunch of success. Below answer is based on my experience in enterprise system design, which is heavily based on Esri solutions. This is just general advice based on what you have given. Forget SHPs, forget fGDBs, store it in a DBMS that supports spatial types. For your bullet points for data storage, a DBMS does all these things. PostgreQL is open source and has a great community. It supports both raster and vector spatial types (no ArcSDE req). If you keep the ArcGIS Desktop clients, they can pull this data in fine. 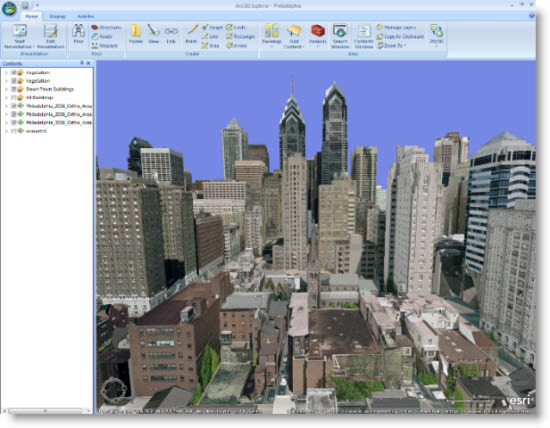 Use the free version of ArcGIS Explorer Desktop (not to be confused with the ArcGIS Explorer Online client). Its far from open source, but its free and in my eyes its a very powerful client perfect for your requirements. Theres actually a new version coming out imminently that looks awesome. Looking at your requirements, I believe it ticks all the boxes. Based on your clients, I would go with a thick client as opposed to a web-based client. This would mean they need to download/install this client, but you can centralise settings if every one of your users can point to a single application configuration file. You mention 3D, so that was another reason I choose this application. 3D in the browser is very close, but not just yet. However, the caveat with this viewer, is that at the time of writing, it looks like it wont pull in spatial data direct from a DBMS, unless it has been registered as a geodatabase. This could be a showstopper for you, as you would need to use an ArcSDE license to do this. It does support pulling in WMS, so if you include a GIS Server like Mapserver into your stack, then this could serve out the data from PostgreSQL as WMS, to be consumed in ArcGIS Explorer Desktop. Please see other answers for alternative viewers (or if I have time for more thinking, ill come back and edit this A). Multiple organisations usually means active directory authentication is not an option. Make use of security at the postgreSQL level to create logins for each organisation. You mention cloud, so nothing stopping you serving postgreSQL up from a provider like AWS. Shop around for prices from other providers in your region. AWS will already have template AMIs with postgreSQL already loaded up on. What you want can all be done with several different open source components. Nevertheless, your requirements are too ambitious, and you will not find a single package/installer that is a turn-key solution. Host it at AWS. Look at Geoserver. Store it in PostGIS. Custom build with Django. These things are Open Source, so it means you have different alternatives for each project with different advantages/disadvantages. Scalable on demand—If you need more computing power, you can launch additional EC2 instances, which you can think of as virtual servers on Amazon's cloud that are all created from the same parent AMI. Creating new instances can even be done programmatically in response to usage statistics. New instances can be created in a matter of minutes, allowing your ArcGIS Server to gracefully respond to abrupt spikes in traffic. Amazon provides a load balancer that you can use to route traffic to the different instances. When you no longer need the instances, you can destroy them and incur no further charges for them. Maintaining conditions you have, Jelastic can be a better solution, Its supports all aspects of GIS like - GeoNetwork deegree OpenLayers and super easy to implement. http://www.gishosting.gter.it/home/ is a new solution actually developed in italian but available everywhere. It use QGIS, QGIS-server, Lizmap web-client and (optionally) PostGIS and is totally open source based . Disclosure: I'm a developer of the GIsHosting solution. Not the answer you're looking for? Browse other questions tagged open-source-gis software-recommendations cloud-gis or ask your own question. Integrate QGIS into Hadoop cloud is it possible? Steps for redistricting using ArcGIS Desktop or Open Source GIS? Looking for free / open source Lidar web viewer? Equivalents of Esri products in open source for Web Mapping?